Floods across the Northeast and continuous rain pouring the night before did not stop this week's ride. Like clockwork, the rain started letting up in the early morning. By 9am the sky remained cloudy, but precipitation had stopped. Calls were made to the scheduled riders and the meeting sight was set. What better place for the Coney Island chapter of the Unicycle Tour to begin but the Coney Island Side Show. The riders included Rob, Keith, Kyle, and Harry. Harry is Kyle's younger brother on a one week leave from the Navy. Although Harry had not been on one wheel for a few years, he was able to jump on and ride into the morning sun. Also meeting us at the Sideshow was NY Post writer Jeremy Olshan and daring photographer Greg Mango. The pre-ride discussion covered many of the issues that the NY Post regularly delves into such as politics, religion, city living, economics, and sports. The most striking thing we learned was that Tiger Woods had been featured on the Post's cover for 21 consecutive days. This record beat by a full week the Post's 9-11 front page coverage. We took a quick photo in front of the banner line then headed to the Boardwalk for a few more shots before pedaling off to the bridges. Major construnction on the Boardwalk forced temporary closures, so we rode in circles waiting for cranes to quit moving and gates to open. For Kyle, it was a ride in the shadows of his employer. During the baseball season Kyle is a featured performer at Keystone Park, home of the Cyclones. Kyle showed us a fenced in abandoned lot where many home run balls lay rotting in the sand and mud. 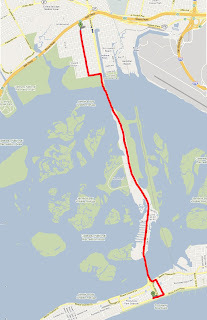 The ride from the boardwalk to the Cropsey Ave Bridge was short and easy. It was at the bridge that we learned about photographer Harry's daring prowess. He was willing to face the gaping jaws of death in order to get the perfect shot. He climbed bridges, ran into traffic, and did whatever was necessary to complete his mission. Following his brave climb onto the edge of the bridge, we took note of a spiraling island of filth and debris that formed in the eddy currents of Coney Island creek. We split up with Jeremy and Greg and make the short trek over to the Stillwell Avenue Bridge, where we were rejoined. The Stillwell Avenue bridge is less picturesque than the Cropsey, but we found an old corrugated billboard to use as a backdrop for our group photo. Immediately after bidding farewell to the NY Post, Rob's tire began to loose air. Is it any surprise that the first flat to impede the tour would happen on the fabled streets of Coney Island? We swung by a few auto body shops but no one offered air or assistance. Rob headed out on foot for a bike shop. He was then recommended by a flat fix guy to buy a kit from a grocery store deli. Using the traditional inspection technique of running the finger along the inside of the tire, the small sliver of metal that had worked its way into Rob's tire sliced into his thumb. It was the tour's second injury. The conversation between the flat fix guy and his conversing companion provided a constant barrage of complaints, curses, and racist comments. As he burst into yet another anti-immigrant tirade we rode off. In Rob's absence, Kyle, Keith and Harry came upon with Jenn Gapay, Miss Cyclone (Angie Pontanie), and a crew from the NY Times. In front of the Cyclone we posed for pictures and congratulated everyone on the start of another season at Coney Island. We bid Jen, Angie, and others farewell and headed to the boardwalk to ride the automobile free route to Brighton Beach and find our fourth rider. Nearing the end of our ride, we went to Skovorodka Cafe for vodka, beer, herring, potatoes, onions, and bread. Brighton Beach's atmoshpere makes an afternoon of unicycle, Russian Beer, and shots of vodka make sense. The beer of choice was a Saint-Petersburg brew known as Baltika. As it turns out, both Rob and Keith have spent time traveling and working in Russia, so the Baltika brand was familiar. Starting at Balitaka #7 we consumed their stock, learned about #9 (a REAL man's beer), and were served #5. Next round, the waiter left the cafe, and returned with #9. Consuming a bakers dozen of Baltika and numerous shots of vodka, the sh**faced foursome left the cafe and with declining balancing abilities, pedaling their way back to the boardwalk. Within minutes of mounting their one wheels, each rider met pavement in a different comical pose. With weaving wheels, the tour zig-zagged its way back down the boardwalk in a triumphant parade: 49 Bridges crossed. 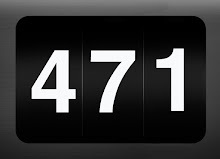 Next week we hit the half a century crossing. The Cropsey Avenue Bridge was built in 1931 as two separate structures sharing common abutments over Coney Island Creek. Both structures are moveable (double-leaf bascule) bridges rotating and opening over the abutments around a trunnion. These structures carry six lanes of traffic, three lanes in each direction. This bridge, together with another bridge (Stillwell Avenue), provides the only access between the communities of Bensonhurst and Coney Island. The Cropsey Avenue Bridge carries a heavy concentration of traffic, both vehicular and pedestrian, especially during the summer months due to its close proximity to the Coney Island beach resort area. B & H Engineering has provided construction support services to the New York City Department of Transportation for the rehabilitation of the Cropsey Avenue Bridge. These services involve: the review of shop, erection, electrical and mechanical drawings including catalogue cuts, approach deck reinforcement, contractor's proposed loading, calculations and procedures for balancing the bridge, temporary structures, survey data, field changes and modifications, concrete haunch tables; the investigation, analysis and preparation of responses to field changes due to unanticipated field conditions; the clarification and furnishing of design intent of plans, specifications, and estimate. Today's ride, our first Thursday outing, began with a snub by Jennifer Miller who once again stood us up after promising she would join us. 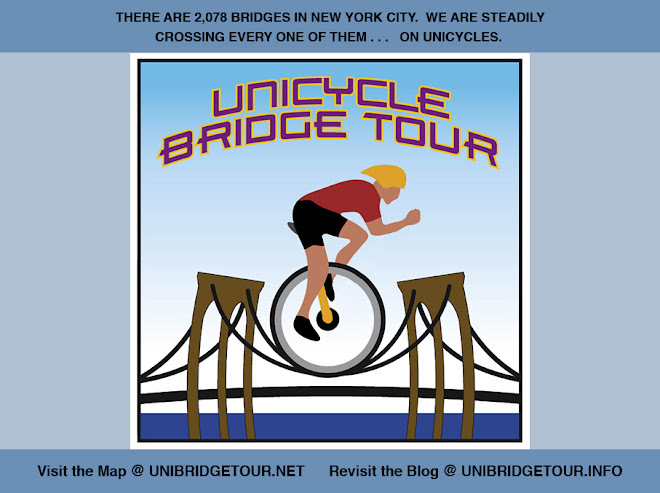 We''ll have to wait yet longer for our first female (and bearded female) NYC Unicycle Bridge Tour rider. Despite this disappointment, we were joined by John Wyffels, a Greenpoint based mono wheeler who regularly makes the trek from Greenpoint to Times Square. This week we visited Flushing Meadows Corona Park, which is the second-largest public park in the City of New York. It was created as the site of the 1939/1940 World's Fair and also hosted the 1964/1965 World's Fair. Our first destination, naturally, was the Unisphere, a monumental 140 foot tall stainless steel globe. It is one of Queens most recognized symbols, and was built for the 1964 World's Fair by the US Steel Corporation. The first bridge of the ride, Perimeter Road Bridge, had beautiful marshland to the right and an expressway overpass to the left. We photographed our big wheels on both sides, which settings couldn't have been more opposite. We were stopped by Daily News photographer Anthony DelMundo who had taken beautiful shots of us riding around the lake. Who knows. We may be on the stands tomorrow. It is by accident that we rolled across a boardwalk that emptied into a construction and dumpster barricaded stadium area. The boardwalk spanned a train yard, and could be argued to fill many requirements of a bridge. Once we recognized the Citifield banner illuminating the sky above the trains, buses, highways, and car parts stores, we knew we were in Mets territory. If only Kyle were to be here to experience the thrill, he could have kept Keith from burying a Yankees momento in the soil. The ride circled the stadium providing a bit of entertainment for many construction workers on lunch. We located a particular bridge on the map called the Tide Gate Bridge. When we got to the foot of the bridge, the sign said Porpoise Bridge. Upon further investigation we found that the span is also known as the Flushing Meadows Corona Park Bridge. It took forever to photograph ourselves with all the passing cars. A van full of policemen stopped and were amused. We photographed our wheels in front of the Queens Museum of Art. 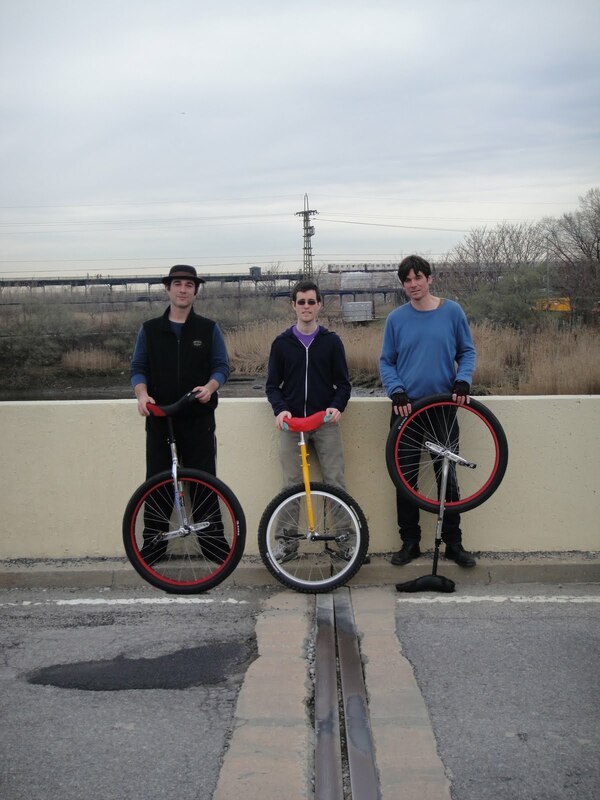 Rob, who teaches art at Hunter College, stated the upside down unicycles' connection to artist Marcel Duchamp was obvious. Having covered most of the bridges in a short amount of time, schedule allowed for a ride around the world. And so we returned to the Unisphere, delighting construction workers and school kids alike. Our final destination was a small wooden bridge located inside the gates of the Queens Wildlife Center. We convinced the guard to not only waive the $7 admission price, but to allow us to bring our unicycles through the gate where a sign clearly stated 'No bicycle Permitted'. As the guard was taking our pictures on the small wooden bridge, who should emerge but his supervisor. We promised the guard we wouldn't blog about this episode. Sorry for breaking our promise. We sincerely hope he's still employed by the Queens Wildlife Center. Flushing Meadows–Corona Park, often referred to as Flushing Meadow Park, Flushing Meadows Park or Flushing Meadows, is located in the New York City borough of Queens, between the Van Wyck Expressway and Grand Central Parkway and stretching from Flushing Bay to Union Turnpike. The second-largest public park in the City of New York (after Pelham Bay Park in The Bronx), it was created as the site of the 1939/1940 New York World's Fair and also hosted the 1964/1965 New York World's Fair. It is maintained and operated by the New York City Department of Parks and Recreation. The park is at the eastern edge of the area encompassed by Queens Community Board 4. The 1,255 acre park was created from the former dumping ground characterized as "a valley of ashes" in F. Scott Fitzgerald's The Great Gatsby. The site, known at the time as the Corona Ash Dumps, was cleared by Parks Commissioner Robert Moses, in preparation for the 1939-1940 World's Fair. Faced with having to dispose of the mountains of ashes, Moses strategically incorporated a significant portion of the refuse into the bases of the Van Wyck Expressway running along the eastern side of the park, the nearby Interboro Parkway (now Jackie Robinson Parkway), and the Long Island Expressway that divides the park into north and south halves. The Grand Central Parkway separates a western lobe from the main part of the northern half, while the east-west Jewel Avenue bisects the southern half. Some of the buildings from the 1939 Fair were used for the first temporary headquarters of the United Nations from 1946 until it moved in 1951 to its permanent headquarters in Manhattan. The former New York City building was used for the UN General Assembly during that time. This building was later refurbished for the 1964 Fair as the New York City Pavilion, featuring the Panorama of the City of New York, an enormous scale model of the entire city. It is currently the only surviving building from the 1939 Fair, and the home of the Queens Museum of Art, which still houses, and occasionally updates, the Panorama. The Unisphere, built as the theme symbol for the 1964/1965 World's Fair, is the main sculptural feature of the park. It stands on the site occupied by the Perisphere during the earlier Fair. The US Open tennis tournament takes place in Flushing Meadows Park at the USTA Billie Jean King National Tennis Center; its center court is Arthur Ashe Stadium and its secondary stadium court is Louis Armstrong Stadium. Citi Field, the current home of the New York Mets, sits at the north end of the park. Shea Stadium, the Mets' previous home, once stood adjacent to Citi Field. Rental boats are available for rowing and paddleboating on the park's Meadow Lake, which feeds northward into the Flushing River and thence into Flushing Bay. Meadow Lake is the site of the annual Hong Kong Dragon Boat Festival in New York, and teams from New York practice in Meadow Lake during the summer months. The American Small Craft Association(TASCA) also houses a fleet of over a dozen 14.5' sloop-rigged sailboats which are used for teaching, racing and recreation by the club's members. Bicycling paths extend around Meadow Lake and connect to the Brooklyn-Queens Greenway. Paths around Willow Lake, the smaller and higher of the two lakes, in a natural wetlands area in the little-used far southern section of the park, are currently closed to the public. The many recreational playing fields and playgrounds in the park are used for activities that reflect the vast ethnic mix of Queens; soccer and cricket are especially popular. The park is also the home of Queens Theatre in the Park, the New York Hall of Science, the Queens Museum of Art, and "Terrace on the Park" (a banquet and catering facility, the Fair's former helipad). The New York State Pavilion, constructed as the state's exhibit hall for the 1964/1965 World's Fair, is also a feature of the park. However, no new use for the building was found after the Fair, and the structure sits derelict and decaying. The other buildings left for a while after the Fair's conclusion to see if a new use for them could be found, such as the United States Pavilion, have subsequently been demolished. One such parcel became the site of the Playground for All Children, one of the first playgrounds designed to include handicapped-accessible activities. The design competition was won by architect Hisham N. Ashkouri and the facility was completed in 1981. It was refurbished and reopened in 1997. On June 24, 2005, the park hosted the Reverend Billy Graham on what he stated was his last tour in North America. A $66.3 million aquatic center, encompassing an Olympic-sized indoor pool and an NHL regulation-sized skating rink, opened in 2008. The facility, utilized by schools, leagues and community members of all ages, is the largest recreation complex in any New York City park, at 110,000 square feet. The complex incorporates features for the physically disabled. Training for the Five Borough Bike Tour (and consequently the Verrazano Bridge) we travelled north of the City for twelve miles of country riding, five bridges and mountain grades unlike slopes previously pedaled. Not a single of today's crossings counts towards the 2078 bridges needed to be crossed in New York City. Keith Nelson, Rob Hickman, and Jim Owen departed Bindlestiff Family Cirkus Hudson, NY headquarters at 11 am. Following a quick stop at Steiner's Sporting Goods for a new pair of cycle shorts for Keith, the trio started the first descent of the day. A quick right at the bottom of the hill started the climb up Mt Merino. The next three miles rolled, climbed, and plummeted with a picturesque view of the Hudson River and Catskill Mountains. We were obviously not the first people to cross the Rip Van Winkle on unicycles, as suicide hotline boxes were conveniently spaced across the span. Stephanie rode with us for the next mile. She directed us into downtown Catskill, before making a U-turn and heading back to Columbia County. The boys headed for the steepest hill of the trip, which dropped us onto Main Street in Catskill. Keith and Rob were both unable to descend the steep grade in one pass, while Jim showed off using only one pedal. At the bottom and after one more turn, we headed across the Uncle Sam Bridge, spanning Catskill creek. Samual Wilson, who inspired the character Uncle Sam, lived nearby from 1817 - 1822. Once across the Uncle Sam Bridge we faced a number of disappointments. The Coney Island Ice Cream shop was closed for another month, and the Captain Kidd Pirate Bar didn't open until 4pm. With no sugar boost or malted nourishment, we headed back across creek and river. The creek re-crossing took place on an unlabeled and dilapidated former rail bridge turned pedestrian crossing. It was now time to climb back up the hills that proved nearly impossible to come down. The return was just as challenging and picturesque as the trip to Catskill. With the sun breaking through the clouds, we encountered a number of pedestrians on the Rip Van Winkle. , rolling along Mt. Merino, back to Hudson, and one more bridge to Cross. A circle to the waterfront provided the crossing of the Ferry Bridge. Jim gave Rob & Keith a rail riding demo in preparation for the many city railroad bridges needed to be traversed. Lacking the third rail, Amtrak rails are much safer than NYC subway bridges. Yuengling tastes great after 12 miles of riding. 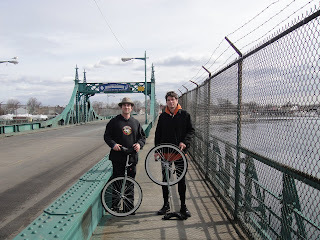 The rest of the day was spent pedaling penny farthings and going to Hell on Wheel, the Chatham Unicycle Club. Today's ride coincided with St Patrick's Day. Realizing that Manhattan would be filled with amateur drunks both on sidewalks and on the roads, the unicycle ride was planned for Prospect Park in Brooklyn. In celebration of unihood, Rob and Kyle rode nearly matching 29" wheels. Keith rode his trusty 26" and Daryll John furiously pedaled atop his well worn 20". Joining the tour for the first time was Shuan "Thunder Calves" Sim. His nickname was outed by his fellow riders from the the Singapore Unicycle Club following us on Twitter. In this grand celebration of the lack of Irish blood amongst the riders, Rob was the only one to wear a green shirt. Viveca Gardiner had donated a green St. Patrick's Day goofy top hat for Rob to wear. Much to Rob's relief, Keith "accidently" left it behind. 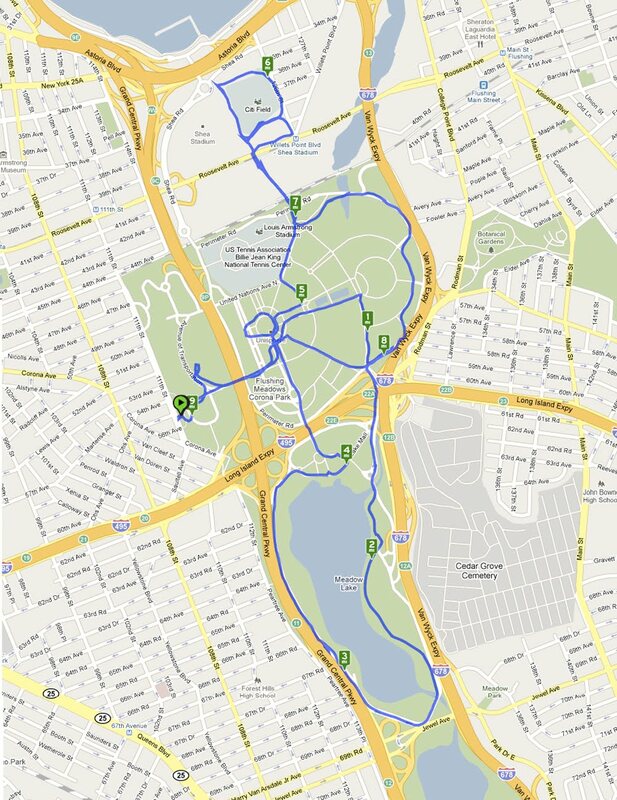 With the sun at our backs and the unseasonal warm weather upon us, we left Williamsburgh for the four mile ride to Grand Army Plaza. Along the way Shuan and Kyle made racing challenges to one other and would roll off in a burst of pedaling fury. 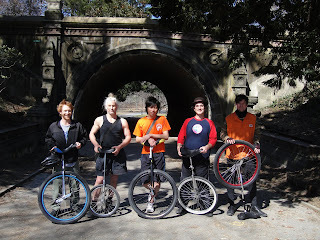 Following a picture taking session in front of the arch at Grand Army Plaza, the five wheel crew entered Prospect Park to set a new record for the Bridge tour: to ride the most bridges in a single day. Our first bridge was actually labeled as an arch but falls under the category of Bridges in Prospect Park. Picure taking complete, we went for a ride around the loop. There was much name calling back and forth with the spandex teams of cyclists. We cut into the park through the Concert Grove and headed in toward the boathouse where we found a bevy of bridges. The park still had remnants of the recent Noreaster that blew through NYC. Trees crossed the path and were precariously balanced against other trees. Although Daryl's 20 inches lagged a bit behind the 29 plus inches of the other four riders, he was the star when it came to riding large trees. Like a real lumberack, he wrapped his wheel into the bark and plowed up the tree. Click here to see the shenanigans! Prospect Park provided the turf for the first boulder built bridges we had ridden. To commemorate the boulder, Darryl carried Kyle across on his shoulder. We crossed a total of 13 bridges today bringing the final count to 41. Prospect Park is a 585-acre public park in the New York City borough of Brooklyn located between Park Slope, Prospect-Lefferts Gardens, Kensington, Windsor Terrace and Flatbush Avenue, Grand Army Plaza and the Brooklyn Botanic Garden. It is run and operated by the New York City Department of Parks and Recreation and is part of the Brooklyn-Queens Greenway. The park was designed by Frederick Law Olmsted and Calvert Vaux after they completed Manhattan's Central Park. Attractions include the Long Meadow, a 90-acre meadow thought to be the largest meadow in any U.S. park; the Picnic House, which houses offices and a hall that can accommodate parties with up to 175 guests; Litchfield Villa, the home of Edwin Clark Litchfield, an early developer of the neighborhood and a former owner of a southern section of the Park; Prospect Park Zoo; a large nature conservancy managed by the Wildlife Conservation Society; The Boathouse, housing a visitors center and the first urban Audubon Center; Brooklyn's only lake, covering 60 acres; the Prospect Park Bandshell that hosts free outdoor concerts in the summertime; and various sports and fitness activities including seven baseball fields. There is also a private Society of Friends cemetery on Quaker Hill near the ball fields, where actor Montgomery Clift is interred. During the American Revolution the Park was a site of the Battle of Long Island. American forces attempted to hold Battle Pass, an opening in the terminal moraine where the old Flatbush Road passed from Brooklyn to Flatbush. It fell after some of the heaviest fighting in the engagement, and its loss contributed to George Washington's decision to retreat. The City of Brooklyn built a reservoir on Prospect Hill in 1856. Preserving the Battle Pass area and keeping the lots around the reservoir free of buildings were two reasons for establishing a large park in the area. The Dairy Farmhouse, ca. 1870, stood near the crest of Sullivan Hill, adjacent to Boulder Bridge and the Ravine. It was demolished in 1935. The original impetus to build Prospect Park stemmed from an April 18, 1859 act of the New York State Legislature, empowering a twelve member commission to recommend sites for parks in the City of Brooklyn. Of the seven sites mentioned in their February, 1860 proposal, a 320-acre plot centered on Mount Prospect was the most ambitious. Under 1861 plans prepared by Egbert Viele, this "Mount Prospect Park" was to straddle Flatbush Avenue and included the eponymous Prospect Hill and territory now occupied by the Brooklyn Public Library, Brooklyn Botanic Garden, and Brooklyn Museum. By the end of 1860, land had been purchased for Viele's plan, but the Civil War stopped further activity. According to Lancaster (1972), the delay prompted some reflection; James S. T. Stranahan, then President of the Brooklyn Board of Park Commissioners, invited Calvert Vaux to review Viele's plans early in 1865.Vaux found the division of the park by Flatbush Avenue problematic, thought that the park should have a lake, and urged for southward expansion beyond the city limits and into the then independent town of Flatbush. Vaux's February 1865 proposal reflected the present day layout of the park: three distinctive regions, meadow in the north and west, a wooded ravine in the east, and a lake in the south, without the division by Flatbush Avenue. Vaux included an oval plaza at the northern end of the park: the prototype for Grand Army Plaza. The revised plan called for purchase of additional parcels to the south and west to accommodate Prospect Lake, but it left outside of park boundaries parcels already purchased east of Flatbush Avenue, including Prospect Hill itself. It would be incorporated as Mount Prospect Park in 1940. The change in plans was not without consequences. Land speculation was under way, and the stretch along Ninth Avenue (now Prospect Park West) was held by real estate developer Edwin Clarke Litchfield who in 1857 had erected his home, Litchfield Manor, on the east side of the avenue. The 1868 purchase of his holdings, the lots between Ninth and Tenth Avenues and from 3rd to 15th streets, including his manor, cost the Parks Commission $1.7 million USD, forty two percent of the overall expenditure for land. The lots, however, constitute just over five percent of the park's acerage. Ironically, much of this very expensive acerage presently houses the maintenance yards and is rarely seen by the public. Despite the repercussions of Vaux's revisions, Stranahan championed the plan. Vaux recruited Olmsted and formally presented their proposal in January, 1866 and it was accepted in May, with work commencing in June. The park commissioners opened the park to the public on October 19, 1867, while it was still under construction. Work continued for another six years until it was substantially complete in 1873, though certain facets of the original design were never undertaken. With the financial panic of 1873, Olmsted and Vaux ceased significant operations in the park and dissolved their partnership. Overall, the cost of acquiring the Park land by the City of Brooklyn was upwards of $4 million. The actual cost of construction of the Park amounted to more than $5 million. Although designers Olmsted and Vaux enjoy twenty-first century fame, Stranahan was regarded by his 19th century peers as the true "Father of Prospect Park", a reputation established through his 22 year reign as Park Commission president (1860 – 1882), engagement of Olmsted and Vaux, overseeing complex, politically charged land acquisitions, securing funding to build the park, and, after its completion, defending its design against unwanted changes, leaving Brooklyn perhaps its greatest legacy. His statue appears just inside the Grand Army Plaza entrance, sculpted by Frederick MacMonnies and presented to Stranahan in June, 1891. In 1882, Brooklyn mayor Seth Low did not reappoint Stranahan or the other commissioners, a change that neither Stranahan nor the other commissioners actively opposed. Stranahan, for his part, was becoming more engaged in other Brooklyn concerns. The action, however, did signal a change in the style of park management, which grew to embrace neoclassicism. With construction of the Memorial Arch at Grand Army Plaza, the park commissioners engaged McKim, Mead, and White to redesign the Plaza in a complementary, neo-classical way. By 1896, Grand Army Plaza sported four towering granite columns adorned with carved fasces and eagles at the base. Granite fencing with decorative bronze urns replaced simple wooden fencing, and polygonal granite pavilions on the east and west corners of the park supplanted earlier rustic shelters. All the major entrances of the park gained similar neoclassical treatments. By the turn of the twentieth century, sculptures by Frederick MacMonnies graced the Arch and works by MacMonnies and Alexander Proctor graced many of the entrances. Neoclassical structures appeared within the park as well. In 1893 and 1894, the Children's Playground and Pools in the northeast quadrant of the park were transformed by McKim, Mead and White into the Rose Garden and the Vale of Cashmere, each a formally arranged space. Stanford White's 1895 Maryland Monument, near the Terrace Bridge, was dedicated on the slopes of Lookout Hill. The 1904 Peristyle, 1905 Boathouse, 1910 Tennis House, and 1912 Willink Comfort Station, all designed by Helmle, Hudswell and Huberty, alumni and proteges of McKim, Mead, and White, spread neo-classical examples throughout the park. The city of Brooklyn's merger with New York City in 1898 aligned the fortunes of Prospect Park with a larger park system. From World War I to the administration of Fiorello La Guardia, investment in park infrastructure declined. New structures were limited to the Picnic House, (1927) which replaced an earlier rustic structure that had burned down in 1926, and a small comfort station at the Ocean Avenue entrance (1930), both designed by J. Sarsfield Kennedy. New memorials were limited to the 9th Street memorial to Marquis de la Fayette (1917) and the Honor Roll Memorial (1920), near the present day skating rink. Prospect Park was in stasis, and it was run, year after year, with declining budgets, a malaise affecting all city parks. "By the 1930s," the New York Times observed, "generations of Parks Department officials had lived well and got rich by diverting maintenance funds, and the park showed the result of a half century of abuse and neglect." In January 1934, newly elected Mayor Fiorello La Guardia appointed Robert Moses commissioner of a unified parks department, a new organization that eliminated borough park commissioners. Moses would remain Park Commissioner for the next twenty-six years, leaving distinctive and controversial marks on all the city parks. Moses readily tapped federal monies made available to relieve Depression era unemployment. He assembled 1,800 designers and engineers centered at the Arsenal in Central Park. In addition, 3,900 construction supervisors in the field oversaw the work of 70,000 relief workers. In the years up to World War II Moses built the half million dollar Prospect Park Zoo (1935), the Prospect Park Bandshell (1939) and children's playgrounds throughout the park. World War II brought a hiatus in this frenetic activity. During the war, Prospect Park hosted a portion of the city's antiaircraft defense. Three hundred soldiers manned batteries, underground ammunition dumps, observation towers, repair shops and barracks around Swan Lake in the Long Meadow. Disbanded in 1944, traces of slit trenches and sandbagged gun emplacements could still be found years after the end of hostilities. Peacetime improvements resumed at a slower pace after World War II. In 1959, the southern third of the Long Meadow was graded and fenced off for ballfields, while in the following year the Kate Wollman Skating Rink was built in a land-filled portion of Prospect Lake. For the first time, the Wollman rink furnished a consistently reliable setting for ice skating, replacing the customary Lullwater venue which had always been subject to seasonal fluctuations in ice thickness. The playgrounds, ballfields, and the skating rink reflected Moses' commitment to modernity and athletic recreation, coupled with only a limited appreciation of the park as a work of landscape architecture. In furnishing a reliable skating venue, the Wollman Rink caused the removal of Music Island and the panoramic view of the lake which had once been visible from Concert Grove. Clay Lancaster, curator of Prospect Park in the 1960s, found such trade-offs wanting. An early critic of Moses, he termed many of his park contributions "centripetal". The zoo, bandshell, ballfields, and skating rink drew people out of the park and into specialized structures, "...which are not the park at all but extraneous attractions, and those surrounded by knit-wire fences exclude all but participants." Many Moses era projects entailed the destruction of Olmsted and Vaux or neoclassical works. The Dairy Farmhouse, Concert Grove House, Music Island, the Old Fashioned Flower Garden, many of the original rustic structures, the Thatched Shelter, the Model Yacht Club and the Greenhouse Conservatories had all been lost to either accident or deliberate demolition by the time Moses left his Park Commission post in May, 1960. No park commissioner since Moses has been able to exercise the same degree of power. Nor did the Park Commission remain as stable a position in the aftermath of his departure, with eight commissioners holding the office in the twenty years following. This instability, coupled with the 1970s city fiscal crisis, devastated the Parks department. Staffed by 6,000 personnel in 1960, the Parks department consisted of just 2,800 permanent and 1,500 temporary workers by 1980. Much of Prospect Park suffered soil erosion and lack of maintenance caused the landscaping to deteriorate. By 1979, park attendance dropped to two million, the lowest recorded level in the history of the park. In September 1964 the Parks Department was within forty-eight hours of demolishing the Boathouse on the Lullwater. At the time the structure was underutilized; the boat concession only operated on weekends and the Boathouse was visited by fewer than ten people an hour, even on the busiest summer weekends. It was not unusual in the Moses years and the decade after his departure, to quietly remove underutilized or redundant structures; it was regarded as economical and prudent management. In the previous decade, the greenhouses on the western edge of the park were considered redundant, given the nearby Brooklyn Botanical Garden, and were demolished without much protest. Much the same had been the case in previous decades. With the opening of the new zoo in 1935, The Dairy Farmhouse had been demolished along with the rest of the Menagerie, though it had predated the original zoo. The Concert Grove House had been demolished in 1949. Once the park's restaurant, it was replaced with a snack bar under the Oriental Pavilion. But the late 1963 demolition of Pennsylvania Station in Manhattan had spawned a nascent historic preservation movement, and the 1905 Boathouse shared many features with the famous station. A preservation group, The Friends of Prospect Park, including in its membership, poet Marianne Moore, built public awareness over disappearing historical structures and threatened flora within the park. Public pressure induced Park Commissioner Newbold Morris to rescind the decision to demolish the Boathouse in December, 1964. The Koch administration formed plans in 1980 to turn over the administration of the troubled Prospect Park Zoo to the Wildlife Conservation Society. In the 1980s the Parks Department began entering into restoration projects with the Prospect Park Alliance, a local non-profit organization. In 1987, this organization secured funding for and oversaw the restoration of the 1952 Carousel. Through the 1990s, the Alliance oversaw the restoration of the Ravine, the 150-acre region which contains the headwaters of the park water system. The Alliance remains active in restoration projects and takes a balanced approach between historical preservation and patterns of modern use. Though disliked by some preservationists, Moses era playgrounds and the Bandshell are being retained because their venues are popular. Original rustic summer houses have been restored or recreated on the shores of Prospect Park Lake, along the Lullwater and in the Ravine. The Kate Wollman skating rink, unpopular with park preservationists but enjoyed by the public at large, will be replaced by two rinks in the proposed Lakeside Center, slated for construction in the nearby Concourse beginning in 2008. These plans include restoring Music Island and the original shoreline, both obliterated by the construction of the original rink in 1960. The Alliance managed a $9.8 million USD budget in 2007, with financial support largely coming from foundations, sales, rentals and fees, corporate and individual donations. Over 80% of the Alliance's expenditures were in support of park development projects. Large sections of the park remain in disrepair, but the downward decline has been checked. From a 1979 nadir, when only an estimated two million people visited the park, now over seven million visits occur annually. Yet additional funding, and time, will be needed before the park again fulfills the design set forth by Olmsted and Vaux. As a work of engineering and landscaping Prospect Park was so revolutionary in its time that many considered the Park a work of art in itself. Others were critical of the idea of building a single, large park in the wealthiest section of Brooklyn rather than several smaller parks at different locations to serve a wider public. The idea of a single, large park won out, and its backers overcame their opponents in Brooklyn politics by having the park built by a state-appointed commission. Olmsted and Vaux engineered the Park to recreate in real space the pastoral, picturesque, and aesthetic ideals expressed in hundreds of paintings. Breaking ground in June, 1866, they created the large Long Meadow out of hilly upland pasture interspersed with peat bogs, they moved and planted trees, hauled topsoil and created a vast unfolding turf with trees placed singly and in groups to approximate the English pastoral style of landscape which had emerged in England in the previous century. Prospect Park's designers had recent precedents in the pastoral style in this country, notably Mount Auburn Cemetery near Boston and Green-Wood Cemetery a few blocks away in Brooklyn. By the 1850s and '60s, pastoralism was the thing in landscape design in eastern North America. Both Central and Prospect Parks are considered by landscape historians to be among the best examples of the type. The designers themselves felt they had greater success in Brooklyn than in New York because the Prospect Park site presented fewer obstacles than the Central Park site, where they had to contend with two reservoirs, a relatively narrow, rectangular site, and a requirement that four city streets cross over the site. The design formula at Prospect Park included elements of both the picturesque and the sublime ideals, the picturesque being represented by the Ravine and its series of pools, waterfalls, and defiles. Although the sublime ideal would be difficult to realize in the gentle Long Island topography, the designers wanted Lookout Hill to be a place of broad views out over Prospect Lake, the farmland beyond, and the bay and ocean in the distance. Trees have been allowed to obscure the view, however. The design also created a visual screen consisting of earth forms and trees around the perimeter to heighten the effect of seemingly limitless rural scenery by screening out views of buildings, traffic, and other aspects of the growing city around the park. The designers did not foresee the high-rise buildings built in the twentieth century which would to some extent spoil the effect. Ironically, at Central Park, views of park scenery in the foreground and skyscrapers in the background have long been iconic New York images. In designing the watercourse Olmsted and Vaux also took advantage of the pre-existing glacier-formed kettle ponds and lowland outwash plains. A winding naturalistic stream channel with several ponds feeds a sixty-acre (24 ha) lake. They crafted the watercourse to include a steep, forested Ravine — perhaps their greatest masterpiece of landscape architecture — all with significant river edge flora and fauna habitats. This was all done to give the urban dweller a "sub-conscious" experience of nature within the city as Olmsted believed it was possible and necessary to provide such nourishment for the general public in the overwhelming urban environments of his time. One of the most noteworthy features of Olmsted and Vaux's creations is the Prospect Park watercourse. All the waterways and lakes in Prospect Park are man-made. Originally engineered by Olmsted and Vaux to be a series of picturesque tableaux as an oasis for urban residents, by the mid-twentieth century nature had taken its course and these artificial waterways and the steep slopes around them had lost their original design character. In 1994 the Prospect Park Alliance launched a 25-year $43-million restoration project for the watercourse. By 2007 the Boathouse was completed. If one follows the water from its source, the water in Prospect Park takes us on a course starting at the top of Fallkill Falls into Fallkill Pool past the Fallkill Bridge through the recently restored Upper Pool and Lower Pool, where migratory birds rest and marsh and other water plants can be found. Past the Esdale Bridge through Ambergill Pond one enters into a tree-covered area, then on to the smaller Ambergill Falls through Rock Arch Bridge, past the gorge area called The Ravine. The design called for the trickle of water to be heard throughout the forest and this effect lasts on to the through the where a variety of waterlilies can be found. The watercourse then moves on to the where performances of music were often given. The waters then cascade beneath the Binnen Bridge to the Lullwater, upon the east bank of which stands the Boathouse, the current Audubon Center & Visitor Center. It then flows under the Lullwater and Terrace bridges to the Peninsula — an area managed both as bird sanctuary and recreational field. It flows past the Wollman Rink and enters the sixty-acre artificially built Prospect Lake that includes several islands. Prospect Lake is presently home to over 20 species of fish and hosts an annual fishing contest; visitors may explore the lake in pedal boats, available at the Wollman rink, or the Independence, a replica of the original electric launch which took day-trippers around the lake a century ago. Ice skating, popularized in Central Park, was a key reason for including Prospect Lake in the design of the park's watercourse. Prospect Lake was much larger than any lake in its New York City predecessor, but very shallow, so as to develop an ideal skating surface. In the late nineteenth and early twentieth centuries, red balls raised high on trollies signified that the ice was at least four inches thick in the Lullwater. Unfortunately, safety concerns have ended skating on the lake, perhaps forever. The venue moved to the Kate Wollman rink in 1960, and will move again to the Lakeside Center around 2010. This trip along the watercourse demonstrates the revolutionary approach of Olmsted and Vaux in their re-creation of various types of natural water formations; not only did they plant a variety of trees, bushes and other plants, but they moved rocks, boulders and earth to simulate a variety of natural environments for the pleasure and stimulation of Brooklyn’s nineteenth century urban dwellers. With the watercourse moving through it, a 146-acre section of the Park's interior at the center of Brooklyn's only forest is known as the Ravine District. Olmsted and Vaux saw the Ravine as the heart of Prospect Park and the centerpiece of mountainous tableaux similar to the Adirondack Mountains. The perimeter of the area is a steep, narrow 100 foot gorge. The watercourse goes through the Ravine en route to the Boathouse. Still recovering from decades of overuse that caused soil compaction and erosion, the Ravine and surrounding woodlands have been undergoing restoration since 1996. As of 2003 the Ravine has been partially restored; the restored section is open to the public. Seven baseball fields span 9th–15th Streets in the park. Two are major league-sized fields serving older age groups. The other five are slightly smaller, for younger children; typically 8–12 years old. The youngest children play on the grass. 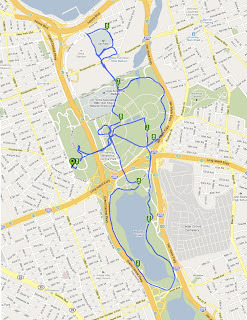 The Prospect Park Track Club, formed in the early 1970s, organizes regular training runs and races in and around the park. (The park has a 3.38 mile or 5.44 km loop.) The Prospect Park Women's Softball League has been playing softball games on summer evenings in Prospect Park for over 23 years. Circle Rules Football has been played every weekend from spring through fall at the tip of the Long Meadow nearest Grand Army Plaza since 2007. Horseback riders from Kensington stables are often seen on paths in the park. Pedalboating is open to the public on the lake. The Bandshell hosts frequent concerts, most notably the "Celebrate Brooklyn!" Performing Arts Festival, a series of summer concerts founded in 1979. Fellowship in the Interests of Dogs and their Owners (FIDO), founded in 1997, is an activist organization for off-leash recreation for dogs in Prospect Park. A contentious debate is underway in city government concerning the role of automobile traffic in the park. One side argues that if the ability of cars to use Prospect Park as a thoroughfare were reduced, traffic on either side of the park would be increased. The other side argues that the park is designed to be a haven from the type of city stress that automobiles represent, and that having them use the park sacrifices the safety of those using the park for recreation. Current (fall 2004) regulations state that automobile traffic is allowed to use the park only 7–9 a.m. and 5–7 p.m. on weekdays. While these are an increase of car-free hours from the past, they leave automobiles in the park at rush hour, the precise time when cyclists, runners, walkers and other park users would otherwise be most likely to use the park. A similar debate is underway concerning Central Park. The debates and issues involved in this type of consideration are a good example of developing a Livable City. 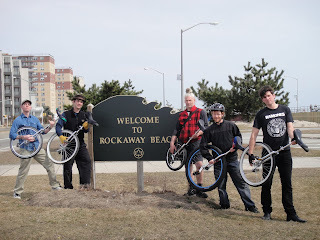 Keith Nelson on a 26", Michael Richter on a 24", Kyle Petersen on a 29", Rob Hickman on a 26", Daryll John on a 20"
It's not hard, not far to reach, we can unicycle to Rockaway Beach. 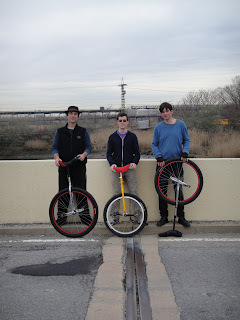 A one wheel tribute to Dee Dee, Johnny, and Joey Ramone. 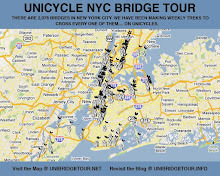 With temperatures in the high 50's and a record 5 riders, the NYC Unicycle Bridge Tour headed to Rockaway Beach pedalling across both the Addabbo and the Cross Bay bridges. We started the 13.1 mile tour in a quiet neighborhood in the Howard Beach section of Queens. Behind a facade of pizzerias and banquet halls sat a neighborhood that appeared to have a block association creed providing an architectural and landscaping cohesion. Each house contained a unique yet similar gaudy style, decked out with fountains, stone elephants, turtles, and the like. Keith reminded us about the three block rule - never criticize someone's house (or business, a performer, venue...) until you're at least 3 blocks away from it. This was not a "Family" neighborhood to talk trash (shhh). 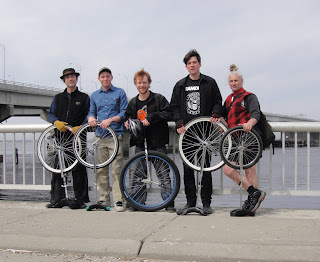 Kyle was on his brand new 29" wheel, effortlessly zipping figure eights around the group. Daryll pedaled furiously on a 20" carrying a shoulder bag loaded with provisions. Richter, recovering from a night of little sleep and plenty of beverage rolled on 24" while puffing cigarettes, sipping coffee, and cranking into many a story. Rob was riding 26" and was able to add multiple free mounts to his personal journey. Keith enjoyed his 26" sitting on an air seat. The first social encounter was a schoolyard full of children on recess. The staff had quieted the children down as we rolled down the street. At first the reaction was a trickle, one by one the kids noticed us, as they ran to the fence that bordered the street. But within seconds, the pitch had reached near Attica levels. Five men on unicycles pumping fists in the air; screams of sheer delight and excitement from hundreds of children; teachers running around in complete panic; the circus had come to town. The kids completely lost they're minds, yelling and screaming, it had become a day to celebrate. It was later learned from the crossing guards, that the school administration was never able to quiet the kids back down after that, and that they had to send them home early that day for their parents to deal with. We approached the water's edge and headed for the Addabbo bridge. We would be riding through the Jamaica Bay Wildlife Refuge, a unit of Gateway National Recreation Area. A huge mound reminded us that the area's previous purpose was that of a garbage dump. The Addabbo crossing was uneventful. Sea shells littered the unicycle lane (must have been left by Bay Gulls). The vast bay surrounded us. Manhattan island could be seen far off in the distance. We arrived on Broad Channel island. 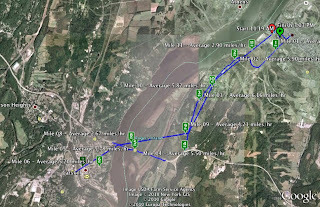 The first several miles is a nature preserve and bird sanctuary. An eagle's nest was spotted perched atop a pole. Canadian Geese appreciate the treasures of U.S. marshes. The eastern part of the island is inhabited by homo sapiens. Protecting the human population on the island was a howitzer and American Legion Hall post 1404. A picture of the unicycles in front of the howitzer was irresistible. Kyle found climbing on the gun even more tempting. Keith and Ricther took note of how truely American the setting was, even down to the giant sand filled urns containing Budwisers, cigarette butts, empty packs of Marlboros and Senecas, and an empty pack of trident. Rob was nervous that our antics were attracting too much attention, especially when two large dually pick-up trucks pulled up to the front of the Legion. This was a land of captains, buccanneers and playboys, every house having at least one boat parked behind it, ranging from deluxe yachts to dingys, row boats to corsairs. And so we continued on to the Cross Bay Bridge. It is a much larger span than the Addabbo. Four wheel vehicles were force to pay a toll to cross. After a bit of confusion we were able to locate the cycle and pedestrian crossing. On the other side was Far Rockaway, a barrier island and subway accessible beach made famous by the Ramones. Unlike the Ramones, Rockaway island was quiet. The lobster house was closed. Boardwalk establishments were boarded up. We headed to the beach. Wheels were dunked into the salty surf, Richter tested the water's temperature and Daryll impressed us with his sand unicycling at water's edge. The group collected sea glass and shells and no unicycles were lost at sea. We pedaled down the boardwalk, and posed in front of a large mosaic whale. Through the support of the local artists, the whale was getting a face lift. After nearly 7 miles, we were over half way and in need of nourishment. And so we went in search of a watering hole. We settled on the Rockaway Beach Inn, where pints of Budweiser were only $2. And above the bar was a mermaid. The Penta-pack of one wheelers saddled up for the return journey. Pick-up from the ride was a bit more of a challenge than expected. The excitement of the ride meant that none had taken specific note of where drop off occurred and these neighborhood mini mansions all looked alike. The Cross Bay Veterans Memorial Bridge (originally Cross Bay Bridge or Cross Bay Parkway Bridge) in New York City, is a toll bridge that crosses from Broad Channel in Jamaica Bay to the Rockaway Peninsula, and is located in Queens. It was built by the New York City Parkway Authority and opened on on June 3, 1939, before the authority was merged into the Triborough Bridge and Tunnel Authority (TBTA). The bridge was a part of a program to develop Jamaica Bay as a recreational area instead of an industrial port. The 1939 bridge was a low-level bascule bridge. Reconstructed and opened to traffic on May 28, 1970, the new bridge is a high level fixed bridge carrying six traffic lanes and a sidewalk on the east side. This allowed boats to pass under it without causing delays because of the lifting the of the bascule bridge. As of March 16, 2008, the toll charge for a two-axle passenger vehicle crossing in either direction was $2.50 (cash), $1.67 (token), and $1.50 (E-ZPass), with discounts for Rockaway and Broad Channel residents. On July 12, 2009, the toll charge for a two-axle passenger vehicle crossing in either direction increased to $2.75 (cash), $1.83 (token), and $1.71 (E-ZPass from a New York State toll agency). E-ZPasses from other agencies are charged the cash rate. Rockaway and Broad Channel residents pay $1.54 per trip with tokens, and cross for free with E-ZPass, since the $1.13 resident E-ZPass toll is rebated immediately after it is charged. The bridge is owned by the City of New York and operated by the TBTA, an affiliate agency of the Metropolitan Transportation Authority. The Joseph P. Addabbo Memorial Bridge (formerly the North Channel Bridge) located in the New York City borough of Queens, is a bridge that runs south from Howard Beach, crosses the Grassy Bay portion of Jamaica Bay to Broad Channel. The bridge is named for the late Joseph P. Addabbo, who represented the area in the United States House of Representatives from 1961 to 1986. The bridge was built alongside the North Channel Bridge as a replacement; a lack of maintenance on the old bridge had allowed it to deteriorate to the point where it was beyond repair. The Joseph P. Addabbo Memorial Bridge is owned and operated by the New York City Department of Transportation. Rob Hickman on a 26", Keith Nelson on a 26"
Today we ventured to city island. With temperatures reaching nearly fifty degrees the remnants of the East Coast Snowmagedon had all but vanished. Going to City Island is like leaving New York City (without ever getting out of the Bronx). It was our most bucolic ride to date. We began at the The Bronx Equestrian Center. Worried at first that these four legged transports would become frightened by our one wheeled vehicles, we quitely pushed the cycles to the road before mounting. The ride had a recurring western flavor. On the island, we would be meeting Angelo Iodice aka A.J. Silver Cowboy from the Boogie Down Bronx. We started first over the Pelham Bridge toward the Bronx Victory Monument. There we gave a Bronx Cheer. The monument is located in the Pelham Bay Park, which is the largest park in New York City. The tree lined Mosholu-Pelham Greenway was peaceful and quite beautiful. It was a contrast from prior rides with the exception of the wild Canadian geese on the loose. After close observation we noticed that these foul were a bit heavy around the waist meaning that these geese were not migrating and had made NYC their permanent home. These are the type of geese that brought an airline jet down into the river. Once again proof of the porous borders of the U.S.A.
We encountered a mob of police, television trucks, and detectives. Apparently a car had been found, belonging to a a doctor from Scarsdale who had been missing since Sunday. We met up with Angelo right before the City Island Bridge. Angelo is a Wild West artist. He was raised as a trick rider and is one of the best rope spinners you will ever witness. He can go under the belly of a horse at full gallop, he can ride Roman on top of two steads, and he can spin a lasso in ways you never imagined. All of these skills he learned in the Bronx. Angelo was riding neither a trusty stead or one wheel, but was relying on the fossil burning four wheels. He rode ahead to meet us again on the island. City island is a gem, and the small bridge connecting it to mainland Bronx is no exception. City Island is located in the Pelham Bay of Long Island sound it is a small slice of New England with all the quaintness beauty and charm. Seafood restaurants line the steets. Every house has a beach in the back yard. Marinas are on every other block. We met Angelo in front of a an amazing looking house with a rich circus history. We peddled to the end of the island seeking clam strips and brewskies. Angelo had suggested Johnny's Fish House as a fine cultural hot spot. It's a destination for many drunks, revelers and fanciers of fried food. Sadly, Johnny's was closed. Off in the distance we could see the Throgs Neck bridge. 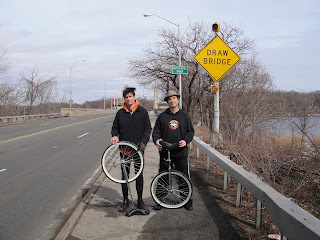 The Throgs Neck is illegal to cross on a unicycle because it lacks the proper lanes. That doesn't necessarily mean we won't be able to one day cross it. We ended up joining Angelo for lunch at the City Island Diner where we dined on clam strips and calamari washed down with cold beer. Before leaving the island we rode to the entrance of the High Island bridge. High Island is privately owed and hosts a number of television transmission towers. The gate to the bridge was locked, so we'll have to return, once we get permission to cross it. The City Island Bridge is a bridge in the New York City borough of the Bronx, connecting City Island and Rodman's Neck on the mainland. It is of stone and steel construction, and spans 950 ft (290 m). Construction was begun in 1899 and completed in 1901, at a cost of $200,000. It consists of five fixed spans and a central swing section which was converted to fixed spans in 1963. The city plans to demolish the bridge, due to its deteriorated condition, and replace it with a cable-stayed bridge. The current design calls for a 150 ft (46 m) high tower, 13 ft (4 m) wide at the top, with a base of 26 ft (8 m). Vertical clearance above high water would be 12 ft. The new bridge would be located in the same footprint as the existing bridge, although it would be 17 ft (5.2 m) wider to accommodate three standard-width traffic lanes, a bicycle lane and a pedestrian walkway. The original schedule was for the project to begin in 2007 with completion in 2010, but the project is now scheduled to start in 2011. As of 2005 the estimated cost of the project was $50 million. As of 2009 the estimate increased to $120 million due to redesigns and the addition of related projects. Some residents oppose the design of the proposed bridge and feel that its tower would be out of character with the low-rise homes on City Island. The Pelham Bridge is a bascule bridge located in the New York City borough of the Bronx. It carries Shore Road, and a walkway along the downstream side, over the Hutchinson River. The bridge is operated and maintained by the New York City Department of Transportation. Unlike most movable bridges in the city, Pelham Bridge opens quite frequently; in 2008, it opened a total of 1,446 times. The watercraft traffic is greater than for any other drawbridge in the city. The first bridge at the site was a stone bridge built in 1815 that was destroyed in a storm on April 12, 1816. Another bridge wouldn't be built at the site for eighteen years. The current bridge replaced an older one that required constant, expensive maintenance. The new bridge was opened to traffic on October 15, 1908 before it was fully completed so as to be able to save costs on maintaining the old bridge. During construction, the water main for City Island and Pelham Bay Park had to be interrupted, so water was imported from New Rochelle, costing the city $5,323.93. The bridge was completed on February 17, 1909 at a total cost of $605,274.06. The bridge was reconstructed in 1985. A celebration of the bridge's centennial took place on October 28, 2008. The bridge is sometimes mistakenly called "The Pelham Bay Bridge" in news reports. It is not in or across Pelham Bay itself, but it is well inside Pelham Bay Park boundaries across the Hutchinson River north of Eastchester Bay. Signs saying "Pelham Bridge" were not replaced after windy storms removed them. According to the NYC DOT Pelham Bridge is the most used bridge in New York City.